Iwate Kura Chocolate Stout is a 5% stout from Sekinoichi Shuzo, based in Iwate, Japan. It’s part of their winter seasonal lineup though it is firmly advertised as a beer for Valentine’s Day and as such, it can be found on sale from January onwards, until stocks run out. Unlike other chocolate stouts that may use flavouring or chocolate bars, Iwate Kura Chocolate Stout is brewed using crushed cacao beans, giving it a full chocolate taste and aroma. 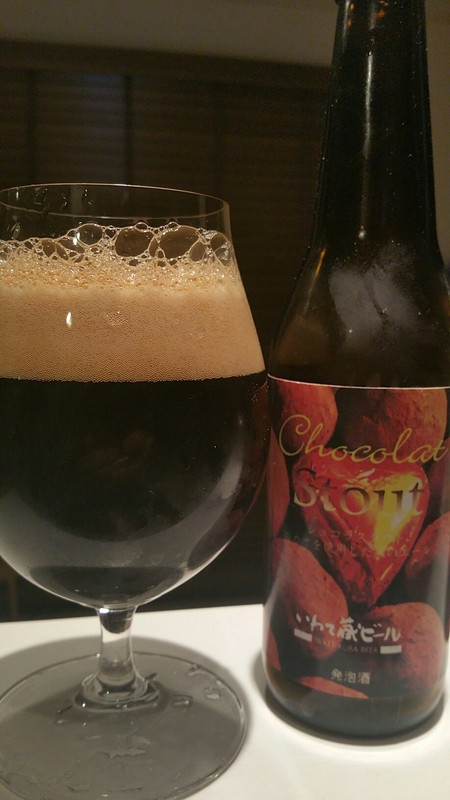 Perhaps one of the most chocolatey beers we’ve had on BeerTengoku. Iwate Kura Chocolate Stout poured… wait, I should use the proper terminology here – glooped out a pitch black colour with a frothy tan coloured head that faded to a thin layer of bubbles, interspersed with a slightly oily slick on top of the beer. It had a strong bitter chocolate aroma – something chocoholics would love, along with some hints of coffee and a slight lactose-like nose to it. Iwate Kura Chocolate Stout didn’t smell overly sickly though – something that worries me with beers that have sweet additions to them. Drinking Iwate Kura Chocolate Stout cold should be forbidden but alas, while we are not in charge of drinking laws and how beers should be drunk, let’s just leave it as a suggestion. When chilled, the flavours in Iwate Kura Chocolate Stout are so subdued that you could easily drink it without thinking much besides some chocolate is present. Let it warm up, and you’re presented with a thick, luscious body oozing in bitter chocolate, with a creamy coffee flavour to boot. It’s very drinkable when chilled, but excels when warmed up – you can usually only expect a body so thick when you’re drinking Imperial Russian stouts, so how Sekinoichi Shuzo made this, deserves some serious plaudits. Iwate Kura Chocolate Stout finished off with the sweet chocolate body – one bottle is enough though. I like the heart shaped cacao bean on the label. Not subtle about the Valentine’s Day marketing at all.